All transactions are safe and secure with a reliable history in online purchasing behind each of our associates. 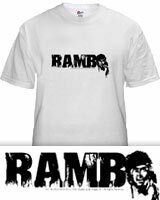 Buy the Rambo Logo t-shirt to own Rambo clothing and merchandise. Celebrate the latest edition to the Rambo movie series with this cool Rambo 4 shirt. The front of the tee features a weathered version of John J. Rambo's last name, with the letter 'O' replaced by our hero's head. His best friend is his machete knife, and he can by recognized by the tail of his red bandana, which hangs down his back. This is the perfect gift for fans who are excited about the Sylvester Stallone Rambo 4 movie. Pair it with a Rambo action figure or movie poster. In addition to the Rambo Logo tee above, browse the Rambo Clothing Gallery for more apparel like men's and women's clothes, kids shirts or hoodies.